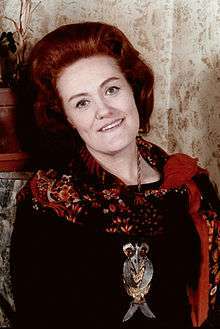 Joan Sutherland was born to Scottish parents in Sydney, Australia, and attended St Catherine's School in the suburb of Waverley, New South Wales. As a child, she listened to and imitated her mother's singing exercises. Her mother, a mezzo-soprano, had taken voice lessons but never considered making a career as a professional singer. Sutherland was 18 years old when she began seriously studying voice with John and Aida Dickens. She made her concert debut in Sydney, as Dido in Purcell's Dido and Aeneas, in 1947. In 1951, she made her stage debut in Eugene Goossens's Judith. In 1951, after winning Australia's most important competition, the Sun Aria (now known as the Sydney Eisteddfod McDonald's Operatic Aria) in 1949. She then went to London to further her studies at the Opera School of the Royal College of Music with Clive Carey. She was engaged by the Royal Opera House, Covent Garden, as a utility soprano, and made her debut there on 28 October 1952, as the First Lady in The Magic Flute, followed in November by a few performances as Clotilde in Vincenzo Bellini's Norma, with Maria Callas as Norma. In 1957, she appeared in Handel's Alcina with the Handel Opera Society, and sang selections from Donizetti's Emilia di Liverpool in a radio broadcast, in which performances her bel canto potential was clearly demonstrated, vindicating her husband's judgement. The following year she sang Donna Anna in Don Giovanni in Vancouver. In 1958, at the Royal Opera House, after singing "Let the bright Seraphim" from Handel's oratorio Samson, she received a ten-minute-long standing ovation. By the beginning of the 1960s, Sutherland had already established a reputation as a diva with a voice out of the ordinary. She sang Lucia to great acclaim in Paris in 1960 and, in 1961, at La Scala and the Metropolitan Opera. In 1960, she sang a superb Alcina at La Fenice, Venice, where she was nicknamed La Stupenda ("The Stunning One"). “Lucia di Lammermoor,” generated so much excitement that standees began lining up at 7:30 that morning. Her singing of the Mad Scene drew a thunderous 12-minute ovation  Sutherland would soon be praised as La Stupenda in newspapers around the world. Later that year (1960), Sutherland sang Alcina at the Dallas Opera, with which she made her US debut. Sutherland's early recordings show her to be possessed of a crystal-clear voice and excellent diction. However, by the early 1970s her voice lost some of this clarity in the middle register, and she often came under fire for having unclear diction. Some have attributed this to sinus surgery; however, her major sinus surgery was done in 1959, immediately after her breakthrough Lucia at Covent Garden. In fact, her first commercial recording of the first and final scene of Lucia reveals her voice and diction to be just as clear as prior to the sinus procedure. Her husband Richard Bonynge stated in an interview that her "mushy diction" occurred while striving to achieve perfect legato. According to him, it is because she earlier had a very Germanic "un-legato" way of singing. She clearly took the criticism to heart, as, within a few years, her diction improved markedly and she continued to amaze and thrill audiences throughout the world. In the late 1970s, Sutherland's voice started to decline and her vibrato loosened to an intrusive extent. However, thanks to her vocal agility and solid technique, she continued singing the most difficult roles amazingly well. As her vocal security to some extent lessened, paradoxically her dramatic grasp of the theatrical moment heightened. During the 1980s, she added Anna Bolena, Amalia in I masnadieri, and Adriana Lecouvreur to her repertoire, and repeated Esclarmonde at the Royal Opera House performances in November and December 1983. Her last full-length dramatic performance was as Marguerite de Valois (Les Huguenots) at the Sydney Opera House in 1990, at the age of 63, where she sang Home Sweet Home for her encore. Her last public appearance, however, took place in a gala performance of Die Fledermaus on New Year's Eve, 1990, at Covent Garden, where she was accompanied by her colleagues Luciano Pavarotti and the mezzo-soprano Marilyn Horne. According to her own words, given in an interview with The Guardian newspaper in 2002, her biggest achievement was to sing the title role in Esclarmonde. She considered those performances and recordings her best. After retirement, Sutherland made relatively few public appearances, preferring a quiet life at her home in Les Avants, Switzerland. One exception was her 1994 address at a lunch organised by Australians for Constitutional Monarchy. In that address, she made remarks about having to be interviewed by a clerk of Chinese or Indian background when applying to renew her Australian passport. Her comments caused controversy among some sections of the community at the time. On 29 November 1991, the Queen bestowed on Dame Joan the Order of Merit (OM). Hamlet—Joan Sutherland, Gösta Winbergh, James Morris, Sheril Milnes, Orchestra and Chorus of the Welsh National Opera. Decca, 433 857-2. 1 2 3 4 5 6 "Icons of Opera – Dame Joan Sutherland", Opera Britannia (6 July 2009). Retrieved 27 September 2010. ↑ Major, Norma (1992). "Sutherland, Dame Joan". In Sadie, Stanley. The New Grove Dictionary of Opera. 4. London: Macmillan. p. 612. ↑ "Australia." The 1991 World Book Year Book. Chicago:World Book, Inc., 1991. ISBN 0-7166-0491-4. 1 2 Martin Kettle, "I didn't want to be a diva", The Guardian, 8 May 2002. ↑ "Dame Joan Sutherland". Sunday Profile. Australian Broadcasting Corporation. 27 March 2005. Retrieved 21 December 2007. ↑ Hide, Carolyn (1996). "Background Paper 9 1995–96: The Recent Republic Debate—A Chronology". Background Papers published 1995–96. Australian Parliamentary Library. Archived from the original on 1 February 2012. Retrieved 21 December 2007. 7 October 1994 Dame Joan Sutherland addressed a lunch organised by Australians for Constitutional Monarchy and said: I was brought up having a British passport and it upsets me that I don't have a British passport now ...; When I go to the post office to be interviewed by a Chinese or an Indian – I'm not particularly racist – but I find it ludicrous, when I've had a passport for 40 years. ↑ "John Major". British Prime Minister's Office. Archived from the original on 16 October 2011. Retrieved 27 September 2013. ↑ Alberto Mattioli, 'Big Luciano, un video per la Stupenda Joan', La Stampa, 23 May 2007. ↑ "BBC Cardiff Singer of the World 2005". Archived from the original on 16 February 2006. Retrieved 2006-02-16. CS1 maint: BOT: original-url status unknown (link). 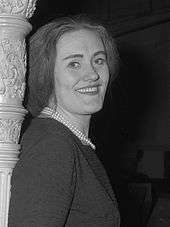 1 2 "Opera star Dame Joan Sutherland dies aged 83". BBC News Online. 11 October 2010. Retrieved 11 October 2010. ↑ "Family: Soprano Joan Sutherland has died, age 83". Associated Press. 11 October 2010. Retrieved 11 October 2010. ↑ "My last days with opera's grandest dame Joan Sutherland". The Australian. 1 February 2011. Retrieved 14 February 2011. 1 2 3 Westwood, Matthew (12 October 2010). "Voice of the century, Dame Joan Sutherland, dies aged 83". Herald Sun. The Herald and Weekly Times. Retrieved 11 October 2010. ↑ Collett-White, Mike (11 October 2010). "Opera great Joan Sutherland dies aged 83". Reuters. Retrieved 11 October 2010. ↑ Barry, Colleen; Jahn, George (11 October 2010). 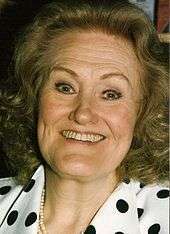 "Joan Sutherland, 'voice of the century,' dies". Associated Press. Archived from the original on 14 October 2010. Retrieved 12 October 2010. ↑ "Joan Sutherland dies at 83". Archived from the original on 22 February 2011. Retrieved 12 October 2010. ↑ "Music: Sutherland: A Separate Greatness". Time. 22 November 1971. ↑ Boehm, Mike (12 October 2010). "Joan Sutherland dies at 83; ranked among the most powerful divas of the 20th century". Los Angeles Times. ↑ Natalie Dessay talks about Joan Sutherland and Maria Callas on YouTube. Retrieved 25 April 2011. ↑ Joan Sutherland talks about high notes on YouTube. Retrieved 19 February 2011. ↑ "Dame Joan Sutherland (soprano)". Gramophone. Retrieved 11 April 2012.